The mere fact that you’re reading this review probably indicates that you own a few gadgets. And with gadgets come charging cables and stands. If your house is like mine, you probably have more charging cables than you have outlets. With so many cables, it’s hard to keep my charging area tidy. And since Apple likes to keep everything white, it’s sometimes difficult to keep the iPod charger and the iPad charger straight. 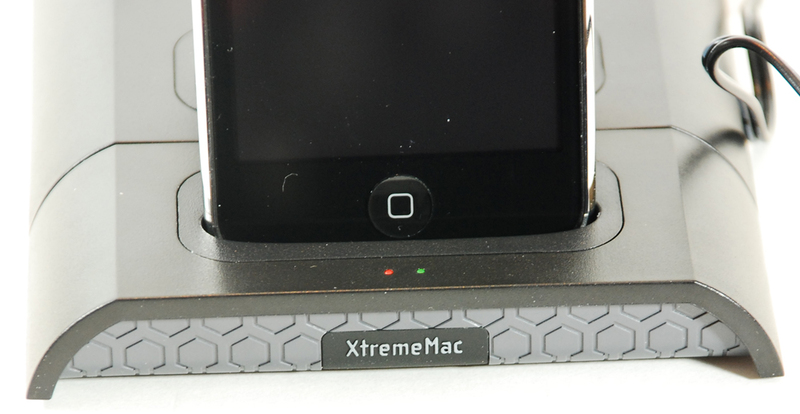 A single device that can charge multiple gadgets helps simplify my charging setup, so I was happy to give the XtremeMac Incharge Duo for iPad charging station a try when they offered one to The Gadgeteer for review. All the pictures in this review can be clicked for an enlarged view. 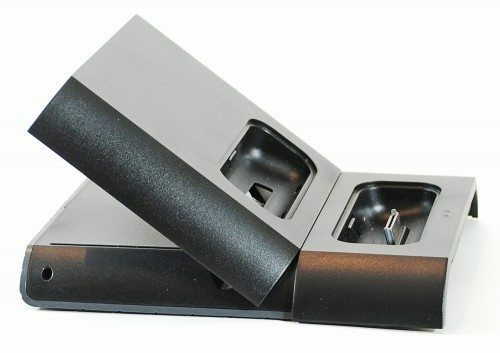 The InCharge Duo for iPad is made of black plastic with dark gray accents. 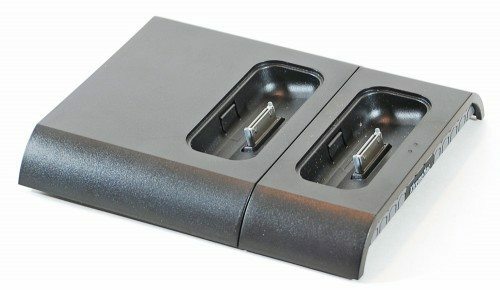 The base has two standard Apple docking connectors. 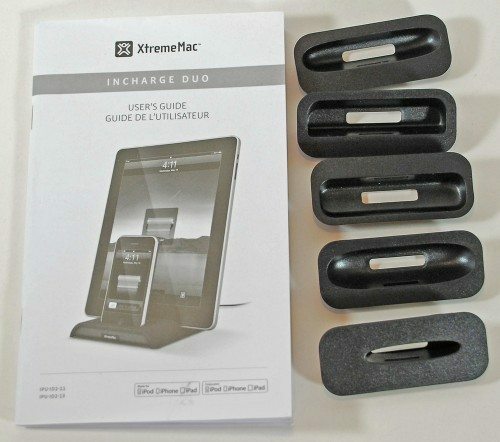 You easily convert the charger from an iPhone/iPod plus iPad charger to a dual iPhone/iPod charger using the two large, removable covers for the back of the InCharge Duo. There are a variety of inserts for the docking wells to support an iPod Classic, iPhone 3G, iPhone 4, iPod nano 5th gen, or iPod touch 2nd gen. You get one each of these inserts. The manual says that the front dock charges at 1 amp for iPhone/iPod. The rear dock charges at 2.1 amps for the iPad, but it can adapt to charge at 1 amp if you have the InCharge Duo set up for charging two iPhones/iPods. There is no switch for the back dock to toggle it between 1 amp and 2.1 amps. 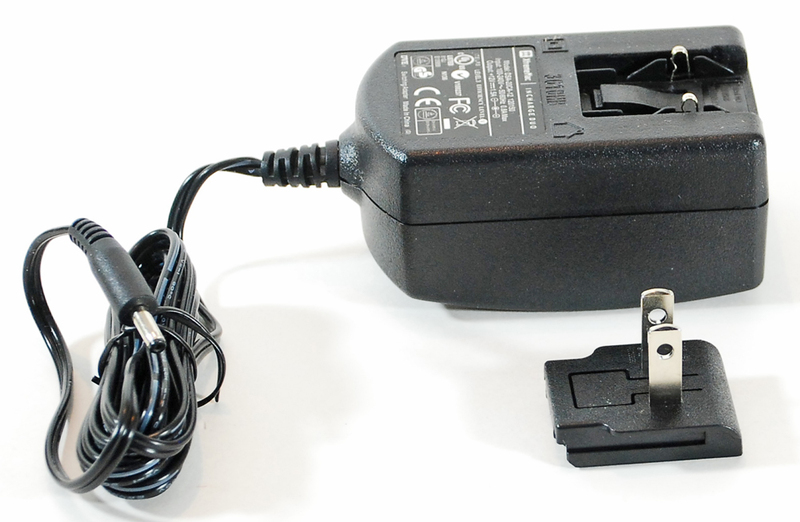 I also looked at the two plates for the back part of the InCharge Duo, but I couldn’t find a peg that depresses a switch to change the charging amperage. 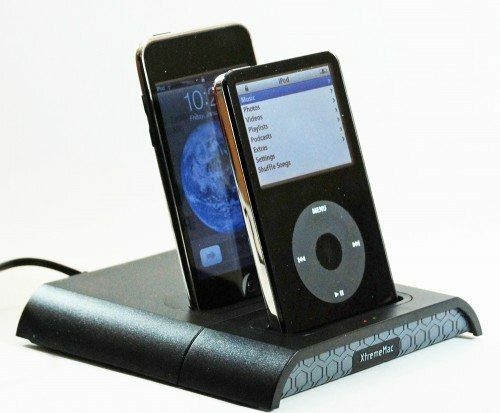 The manual lists the iPods and iPhones that can be charged on the back dock: iPod nano 1st, 2nd, 3rd, 4th, and 5th generations; iPod Classic 160GB 2009; iPod touch 1st and 2nd generation; iPhone, iPhone 3G, iPhone 3GS, iPhone 4. (iPod touch and iPhone models must be iOS 3.0 or later.) All models not listed here charge on the front dock only. The InCharge Duo came with the iPad converter in place. You can see in this photo the iPhone/iPod converter as it is being put on. The front tabs have been placed in the slots, and it is being dropped into position. It’s held in place by friction. To remove the converter, pull up on the back corners. I put the touch 2nd gen insert into the front charging well and the iPad converter on the back of the InCharge Duo for my first attempt at charging two devices. 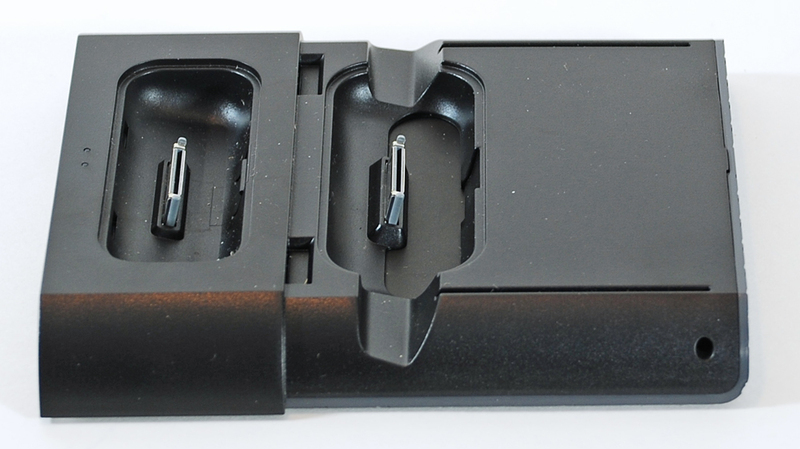 I had to remove my touch from its tiny Belkin Grip Vue case to fit it into the adapter. 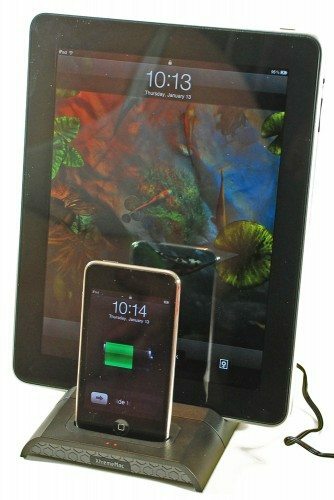 I also had to remove my iPad from its case to fit it into the iPad charging dock. I don’t think any case other than a sticker-type skin will fit with the InCharge Duo. Charging began immediately upon docking. You can see in the picture that both my iPod touch and iPad are charging. There are two charging status LEDs on the front of the InCharge Duo. The left LED shows charging status for the device in the front dock, and the right LED is for the back dock. The LED is orange to let you know the device is docked properly and is charging. When the battery reaches about 95% full, the LED turns green. If you want to charge two iPhones/iPods, you may have to supply your own in-well adapter for the second device. We don’t have iPhones, but we do have multiple iPod touch 2nd gens and a nano 6th gen. There was no adapter for the nano (didn’t fit into the one for the 5th gen), and only one adapter for the touch. We did have an old iPod that fit the adapter for the Classic. Luckily, my touch is using iOS 4, so it could charge on the back dock. Both iPods charged on the InCharge Duo with no problems. 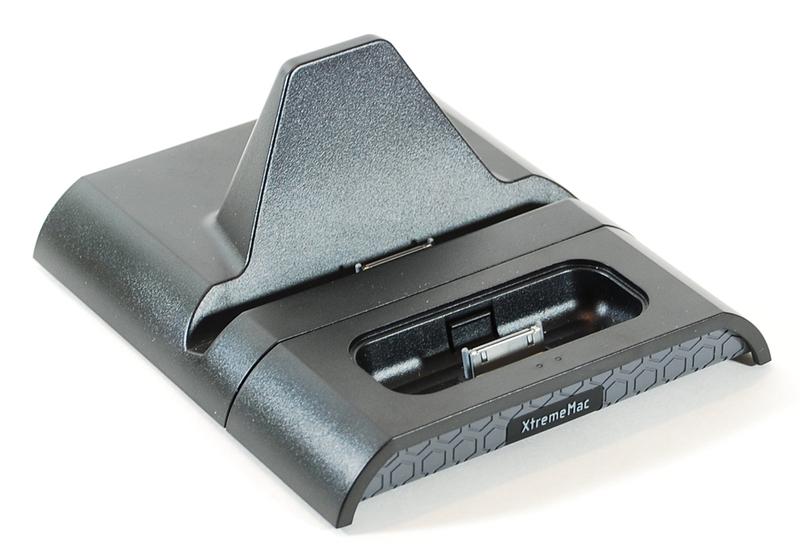 The XtremeMac InCharge Duo for iPad is a great addition to your charging area when you own a variety of Apple iOS devices. You can charge two devices at once using a single outlet. You can also easily convert the iPad dock into a second iPhone/iPod dock to increase the usefulness. Will an iPad with a case (or skin) fit in the dock? 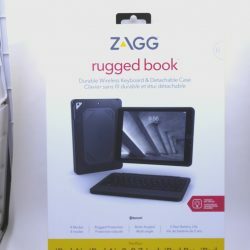 @Gunther I mentioned that I had to remove both my iPad and my iPod touch from their cases before putting them in the InCharge Duo. I don’t have skins for any of my gadget, so I can’t test them. You may be able to fit a sticker-type skin, but nothing else. 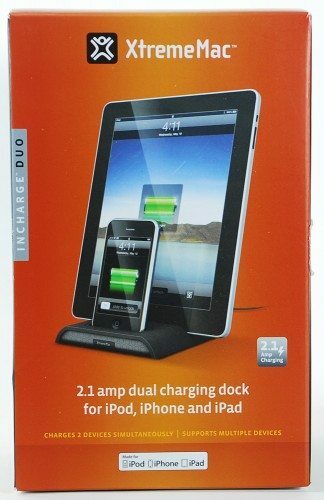 We need some docks that charge from the wall AND sync to the computer. The old Palm docks did this with a splitter so you had one cable that went to the USB port (the first one actually went to an RS232 port!) and then split off to an electrical outlet in the wall. I want to be able to sync to the computer and charge from the wall when the computer is off. I can find ANY docks that do this. Am I the only one looking for that convenience??? I must be. I think XtremeMac used to do a double dock that done what your looking for, sync from a computer and charge from a wall outlet. It was before the ipad but worked for iPhones and iPods. You’d probably be able to get it cheap off amazon.